In the distance you can see the East Viewpoint. The following six photos were taken from various positions on top of that unique land formation. 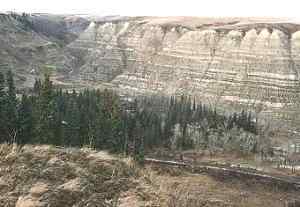 This photo looks south at the north end of the east leg of Horseshoe Canyon.� The above photo was taken from the top right side of this photo. 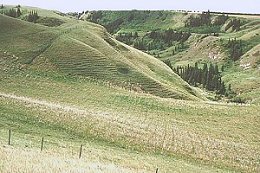 There are faint lines running across the slope in the foreground, and horizontally across the small hill in the centre of the photo.� It could be that this land formation developed in layers. Cows climb this slope as they graze. 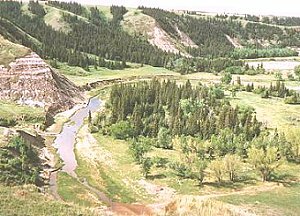 As we swing to the right and more to the West, we see this view of a corner of the Kneehills Creek valley. This link will give you a 78Kb enlargement of the above photograph. Now we are looking directly west.� The line a little above the centre of the photo is an abandoned railroad roadbed.� There was a rumor that at one time they were planning on building the Trans Canada trail through here. For a look at a detailed enlargement 83Kb of the above photograph, use this link. As we keep swinging to the right, we look north-west and see this view. This photo lacks color because it was taken in the late fall. The green ones were taken in June after a wet May, and the one below was taken in early May. 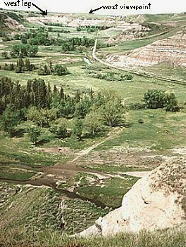 Now, looking north-east, we see a pond which has the distinctive color of the clay above it.� The line running to the left is a gravel road which has been built on top of the old railway roadbed. 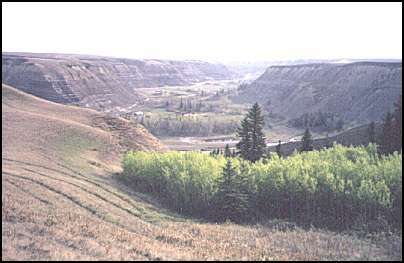 This spring time photo which is looking north-east shows the hamlet of Dunphy in the distance.� Beyond that, just around the corner is the Drumheller valley, and the city is about 10 Km west of there.� This shot was taken from the south end of the East Viewpoint. You can also look at an 89Kb enlargement of a similar photo which was taken in the summer. 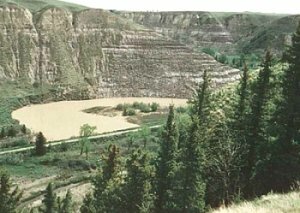 Unfortunately, all of this is on private land and it is uncertain if this would attract enough tourists to make development worthwhile.� The Drumheller valley is full of viewpoints, so nobody is getting excited about this one. was at geocities.com until Sept. 30, 2009.